Fall is a wonderful time to take a vacation to climates that are normally too crowded or too hot to enjoy during summer vacation. Or this can be a time to visit a place where you can embrace fall colors and cozy autumn activities. 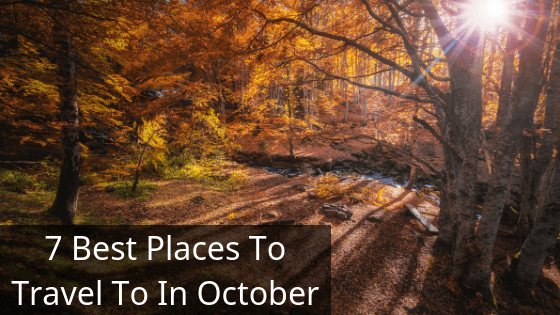 What are the seven best places to travel in October? Just over 150 miles north of San Francisco on PCH is the Northern California gem, Mendocino. Where Bohemians meet wine country, this quirky area is has a heady combination of breathtaking cliffy Pacific views, arty shops and endless rows of organic vines and trees with gorgeous fall colors. The Greek Islands are usually packed with vacationers in the hot summer months, but they are the best-kept secret in October. Warm, but not scorching weather allows visitors to enjoy hiking and exploring as well as avoiding beach crowds. Visit Rhodes for lively Lindos nightlife and antiquities, Crete for hiking or Corfu for luxurious vacationing with the rich and famous on the spectacular Ionian. Off the coast of Tanzania is the enchanting island of Zanzibar. Enjoy swimming or snorkeling at the many pristine beaches. Take a stroll on this magical island and engage your senses with exotic spices, natural beauty, and art. Go on a nature safari, or take a bike on a tour around the islands. Best yet, get cozy with wild animals at Cheetah’s Rock. Avoid the rainy, hot season and visit the Galapagos Islands in dry October. The water is warm enough for a lovely dip. This is peak season for bird and fish species making this the ideal time of year to go to this bucket list destination. No longer an obscure destination for adventurers, Bohol island is filled with secret waterfalls in a stunning natural setting. There is plenty of ways to explore and enjoy the island. Take a moped around the island, snorkel or swing from trees before jumping into the water. Are the Northern Lights on your bucket list? By October the Midnight Sun is long gone and the nights are dark enough to see the magical Aurora Borealis. Make sure to bathe in the warm, thermal waters of the Blue Lagoon, horseback ride in the treeless countryside, be sure check out the Gullfoss and Geiser and party all night in the city that never sleeps. If you are looking for fall colors, the Twin Cities of Minneapolis and St. Paul have a breathtaking array. Take a drive around Lake Minnetonka or a boat ride on the St. Croix River to enjoy the crisp air and the dazzling autumn colors. Visit an apple orchard or pumpkin farm to pick your own or explore a corn maze.